Justin Sirois is a writer living in Baltimore, Maryland. His books include So Say the Waiters, Secondary Sound, MLKNG SCKLS, and Falcons on the Floor, the latter two written with Iraqi refugee Haneen Alshujairy. Justin has received several individual Maryland State Art Council grants and a Baker “b” grant in 2011. His work has appeared in The Collagist, Consequence Magazine, Nano Fiction, and Dark Sky Magazine among others. 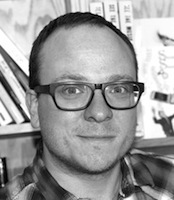 Justin has designed books for Edge Books, Publishing Genius, JMWW, and Texas Review Press. He is currently working on So Say the Waiters (Book 2) and The Last Book of Baghdad. Dan Gutstein: You’ve been sighted on Facebook sitting beside an older gentleman, taking in a ballgame, drinking a beer. Let’s start with origins. Can you say a few words about your peoples? How many mispronunciations of your surname are you willing to tolerate? Are there elements of your family’s background that manifest themselves in your writing? Justin Sirois: Ah, that’s my girlfriend’s grandfather (Gramps) whom I end up watching football with—mainly Ravens games. He’s the silent type so it’s relaxing to sit back without interruption. I think he’s said maybe three words to me during the last two games we watched. If I was drinking a beer, chances are it was an IPA. I’ve only seen Gramps drink wine. I’m pretty distanced from my extended family. One of my grandmothers (dad’s mom) read my work when I first started to write poems, and she called my parents’ house and told my brother, “I hope he never has children.” She died last year. I drove 13 hours to the funeral. My family thought it appropriate to post a photo of her in blackface on a collage of old photos at the viewing. It must have been a Halloween photo from the late 30s. I wrote a novel called DMBSTRCK that is a critique of the way I was brought up, and she is a minor character in it. Dark Sky Books was doing to publish DMBSTRCK in 2013, but they folded a few months ago. People mispronounce my French Canadian last name all the time. I don’t mind. Better to have a last name that’s unique; it’s made my Google presence much easier to manage. I think I own the first 35 hits if you Google my name. DG: The title of DMBSTRCK is reminiscent of another prose book title of yours, MLKNG SCKLS. What was the motivation behind your omissions of vowels, in these titles? What soundings and puzzles do you want readers to consider—in your poetry and prose? JS: The language and sonic quality of my work differs from project to project. It was important to me that MLKNG SCKLS and Falcons on the Floor (SCKLS is a short book of “deleted scenes” from Falcons) had a poetic quality. It just made sense for the characters and plot. Salim, the main character, is a poet and artist at heart. The novel shifts from third to first person and back, but I wanted to maintain lyricism throughout the book. As for the missing vowels in the title of SCKLS, I’m not entirely sure why I omitted them. It just felt/sounded right to me. DMBSTRCK’s missing vowels are more appropriate. The novel is literally about these metal head teenagers growing up in New Hampshire during a plague that makes everyone lose the ability to read. Kids are “struck” first, then older people. So language—the omission of language, the death of the alphabet—is a huge part of that book. My newest series, So Say the Waiters, is straight up fiction. It’s the first literary project I’ve allowed myself to just have fun with. DG: You had a partner, Haneen Alshujairy, for Falcons on the Floor, a novel that describes the plight of two Iraqis who flee Fallujah during the siege in 2004. 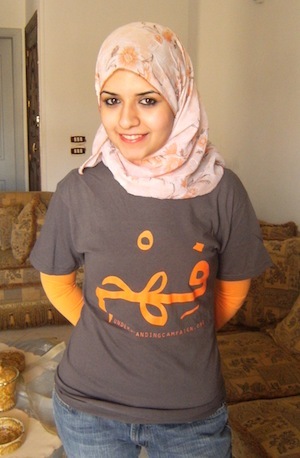 Can you say a few words about how you met Haneen, and how you worked together? Were there other texts that served as inspiration? JS: I started interviewing Iraqis who were still in their country in 2008. Haneen was one of them, but I knew she was special from the first email we exchanged. After a few months of interviewing, I revealed that I was working on a novel, and I asked her if she’d like to consult on the project. She didn’t hesitate to say yes. Now, almost five years later, we’ve never met in person, but we have two books published and a third—The Last Book of Baghdad—completed. It’s a follow-up to Falcons and it follows Salim’s mother, three years later, in Baghdad, after the Al Mutanabbi Street bombing. 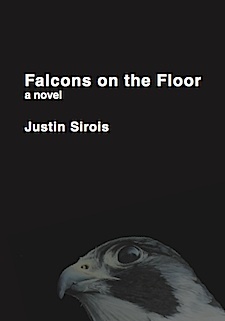 I can’t say that any particular novel inspired Falcons on the Floor. The research involved with SCKLS, Falcons, and The Last Book of Baghdad was intense, definitely the deepest I’ve ever dug into an event. The sieges of Fallujah will remain some of the most important parts of this century. You can Google “Fallujah birth defects” and quickly understand that the US will be paying for that mistake for generations. SCKLS and Falcons was my way of addressing those atrocities and getting a Western audience to care about the people, the city, the culture we maliciously destroyed. DG: You make the peril faced by residents of Fallujah very real in Falcons. JS: You can’t count the number of ways we fucked Fallujah and its people. I hope Falcons will always be a novel that readers can go to for information and empathy. DG: I’d like to turn our conversation to Baltimore, and your home. You’ve recently built an addition onto your property. Can you describe it, and how it’s being utilized? Have you had any gatherings around the fire pit, and how is Mr. Chimney doing? JS: Ah, the cabin. 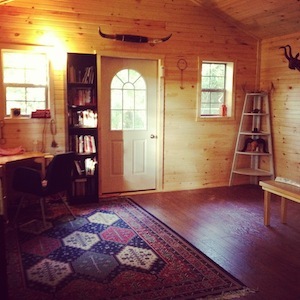 It’s a 16 x 20 foot, pine-lined office in my back yard. I love it. If I didn’t get a weak wi-fi signal out there, it would be perfect for focusing, but right now it’s about 95 percent perfect. All it really needs is a wood burning stove. Fire pit parties have been amazing. We just burned through a half cord of wood in a few weeks so we’ve got to restock. I think Mister Chimney, the poem-cat, is dead. He seemed to be a stray along with about 5-6 other strays in the neighborhood. I was never certain if he was an outdoor cat that someone just let out all the time. I regret not taking him in. Ever meet an overtly kind animal? All love? That was him. DG: I’m sorry to hear about Mr. Chimney. He seemed to be a character, in a town rife with characters. What are some of your favorite Baltimore hangouts? By that, I mean where do you go at 3:00 a.m. if you’re craving a meatloaf sandwich or a crab cake? JS: Thankfully, Baltimore has a thriving creative scene from art to indie music to literature. There’s always an opening or show. So Say the Waiters, my new series, really celebrates the city’s vibrant creative culture. We tend to eat well, so Woodberry Kitchen is on the top of the list. Other hang outs? There’s The Compound, which is a shared warehouse kinda space, but they have a wood burning stove and a fire pit and some of the coolest bathrooms you have ever seen, resort quality bathrooms in an artist space. I love it. There’s also this Korean spot called The Rainbow Room. It’s basically a row house where you rent a living room. In this living room is a big couch, a giant TV, and two mics for karaoke. Imagine the loudest reverb you’ve ever heard. The TVs play scenes of baby animals and people doing water sports while the lyrics scroll. The place stays open until 5am and serves Coors Light. Go a few nights in a row and you will lose your mind. DG: I’ve been a bit cruel in waiting this long to ask you about your new project, So Say the Waiters. Can you describe how the pieces are being released—how the pieces are structured—and how much we should fear this kidnApp? JS: Sure! So Say the Waiters is my new serialized collection. It’s written like a TV show, in episodes, that readers can download. I’ve heard from people that read the entire novel (five episodes) on their smart phone. The series is about a cell phone app that lets people kidnApp each other for fun so it’s appropriate (maybe even a bit meta) for readers to experience the novels on their phones. But that’s just one way to read it; the paperback and full eBook is available on Amazon. The series revolves around kidnApp, an app and social network of Waiters (kidnappees) and Takers (kidnappers). Needless to say, it’s a little crazy, people doing this kidnapping recreationally. What’s crazier is how many readers actually want the app to be real. DG: Can you outline your plans for the future of Waiters? How many books or episodes do you envision, and will there be any upgrades to the kidnApp? How many people will go missing? JS: I have agents considering The Waiters right now—fingers crossed there. If no big publishers pick it up, I’ll keep self-publishing. Book 2 will be out this spring if I go with the self-pub plan. I’d like to continue the series for as long as readers are enjoying it and as long as the characters are developing in a meaningful way. I can see this thing going on for at least 5 books equalling 21-22 episodes. There’s just so much you can do with the plot-line it seems almost limitless. And of course I’d love to see it adapted to TV. There will be upgrades to kidnApp. And other complicated industry-type plots that get introduced. It’s so much fun camping on Facebook and other apps while keeping kidnApp exciting and a little dangerous. DG: What would the world of Waiters look like if Kid n’ Play, for example, were to acquire the kidnApp app? (I’m assuming they’d be kidnApped.) How would that whole situation wind up? JS: Kid n’Play? How about Bieber? Funny you ask, though. Book 2 ends with a celebrity kidnApping that alters the course/perception of Henry and Dani’s online identity. Let’s just say they get a good “boost in ratings”. DG: One thing (of many) that I’ve admired in your writing is the sheer “multi-tasking of your ideas.” This new serialized piece is about technology, and is mostly accessed through technology, and features a generation of characters who are most familiar with technology. Can you talk a little bit about your commitment to ‘connectivity’? JS: I’ve always been interested in communication technologies. Even Falcons on the Floor and SCKLS’s plots are driven by connectivity, the new ways we create identity via social media, and other Internet-related things. Secondary Sound, my first full-length book of poems, is all about digital piracy, copyright reform, and cell phones. My next book of poems (The Heads, Newlights Press) was written on the Net and for the Net, really. So yeah, that’s a huge theme in my work. I love living in an age where people can have voices if they are creative enough. DG: What are some principles—or philosophies—to which you adhere, when you write? JS: There are a few I try to stick to. Only write something that I would want to read. That helps a lot. And Michael Kimball gave me some great advice about not mistaking description for action that really transformed the way I approach prose. There’s a rule I call “Only use what is in the room,” meaning never introduce a character or object into a novel or scene if you can use what is already there. But I think the one principle that’s helped me in my career is always be nice to people—to strangers, readers, to other writers. Be as nice as you can. Even if you need to be a jerk occasionally, apologize when it happens. Buy people lunch. Buy a round of drinks. Give a book away to someone you want to impress. Give people rides and offer your couch to out-of-towners. DG: Man, I think you are nice, and you’re right about that, it’s a lesson that many other writers should note. Let’s turn to a little R ‘n’ R. What’s your favorite BBQ recipe? And when was the last time you chomped down on a good cigar? JS: I’m partial to the bark end of a brisket from Lockhart, Texas. Pork shoulder as well. I’ve tried to cut my cigar smoking down to one a week, but it’s tough. I smoked about one a day for a year and a half. One time I was walking to the cigar shop and did the math and stopped dead in my tracks. NOT a great habit to have. Gimme a good Ashton and a smoked brisket and I might answer anything you ask me.